Combine the sponge ingredients and allow the mixture to rest for 12 to 18 hours at room temperature until it's fully activated. Combine all of the dough ingredients, but salt, and mix on low speed for 2 minutes, till they are well-blended. Let the mixture rest for 30 minutes, allowing flour to absorb the water. Add in salt and knead the dough till it's firm and elastic. Place a shallow pan in the bottom of the oven and start preheating to 250C/500F. Use tiles or stones on the oven rack. 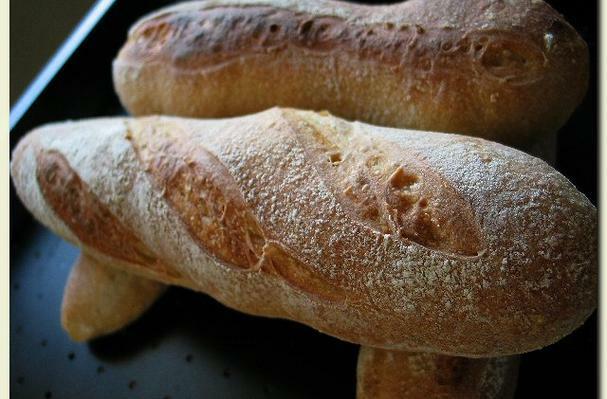 Slash with a razor knife across top of loaves and slide the loaves onto the heated baking stone. Pour a cup of very hot water into the water pan. Close the door and bake for 12 minutes. Lower the temperature to 200CT/400F and continue baking the loaves until golden brown, about 20-25 minutes. Cool them on a rack.